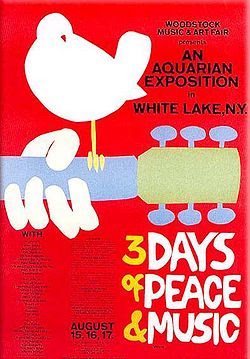 Woodstock Festival - Três Dias de Paz e Música (1970) - Blog Almas Corsárias - 10 Anos no Ar!! Participaram do evento artista ligados a diversos estilos musicais que de alguma forma se relacionavam com as propostas do movimento hippie: o folk, com seu pacifismo e sua contundente crítica social, o rock, com sua contestação ao conservadorismo dos valores tradicionais, o blues, com sua melancolia que havia décadas já mostrava as contradições da sociedade norte-americana, a cítara de Ravi Shankar, representando a presença marcante da influência oriental na contracultura, entre outros. 1. * Crosby, Stills & Nash (and Young) "Long Time Gone"
2. * Canned Heat "Going Up the Country"
3. * Crosby, Stills & Nash (and Young) "Wooden Ships"
4. Richie Havens "Handsome Johnny"
5. "Freedom" / "Sometimes I Feel Like a Motherless Child"
7. Joan Baez "Joe Hill"
8. "Swing Low Sweet Chariot"
9. The Who "We're Not Gonna Take It" / "See Me Feel Me"
11. Sha-Na-Na "At the Hop"
12. Joe Cocker and the Grease Band "With a Little Help from My Friends"
14. Country Joe and the Fish "Rock and Soul Music"
15. Arlo Guthrie "Coming Into Los Angeles"
16. Crosby, Stills and Nash "Suite: Judy Blue Eyes"
17. Ten Years After "I'm Going Home"
20. John Sebastian "Younger Generation"
21. Country Joe McDonald "FISH Cheer / Feel-Like-I'm-Fixing-to-Die-Rag"
23. Sly and the Family Stone "Dance To The Music" / "I Want To Take You Higher"
30. * Crosby, Stills, Nash and Young "Woodstock" / "Find the Cost of Freedom"